Big day for the 8-letter yesterday. 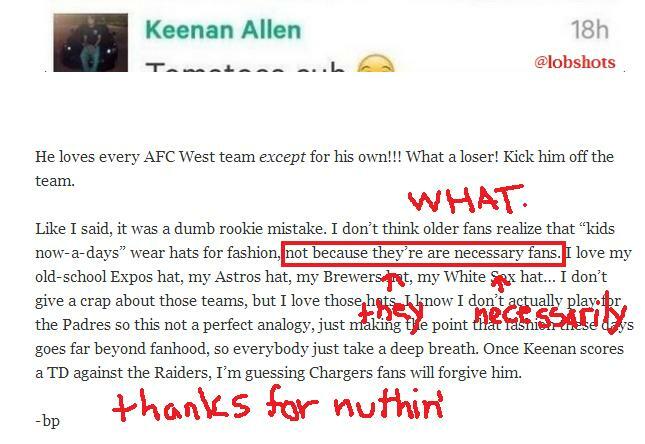 We got linked up by all the big boys for the Keenan hat controversy: Sports Illustrated’s Hot Clicks, Yahoo! Sports, CBS Sports, Pro Football Talk, LA Times, The Big Lead, Bolts From the Blue… even Mashable. All the local news websites were quoting Lobshots too… a nice role reversal since we’re usually getting our local stories from them. I also went on the radio yesterday on The World of Sports with Chris and Ben on XTRA Sports 1360 and chatted about the reaction from Chargers fans about Keenan’s Raiders hat. If you care to give it a listen, you’ll have to hop to the 34:30 mark. Oh, you guys know what a stickler I am for spelling and grammar… so when Caster brought this to my attention this morning, I was fuming. That’s from the Keenan post, which I’ve since corrected. How ’bout a little heads up next time I botch a sentence like this, guys? 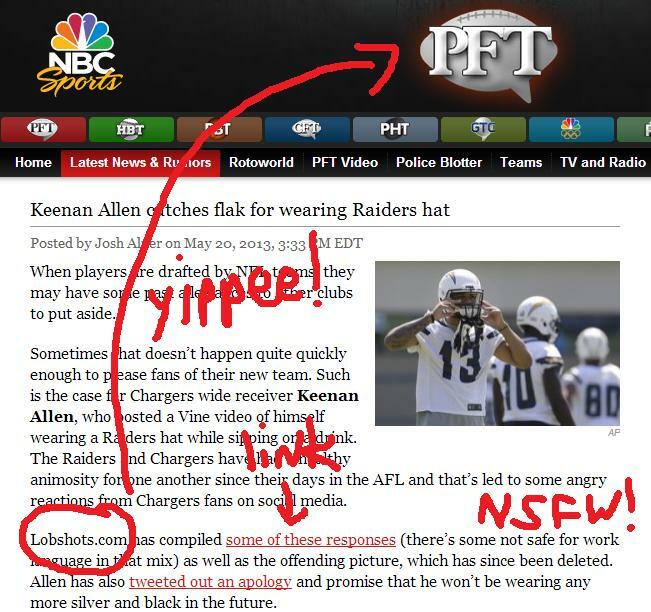 This entry was posted in Media, NFL and tagged ben and chris xtrasports1360, keenan allen, keenan allen hat. Bookmark the permalink.